"Simon, son of John, do you love me"
You may recall that sorrowful scene from the Passion accounts when Peter, while in the light of a charcoal fire in the high priest's courtyard, denied Jesus three times. Imagine Peter's shame and sorrow as he realized his failing. How would you react if your best friend abandoned you in your hour of need? Jesus shows us how in today's Gospel passage(John 21:1-19). 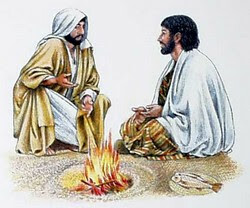 Peter is now again seated next to a charcoal fire as Jesus undoes his triple insult by asking him three times, "do you love me", and then Jesus re-commissions him to feed his sheep, feed his lambs. As if to say, Peter, you're still my guy, I forgive you; I have faith in you, I love you. Peter and a number of disciples went fishing on the Sea of Tiberius. "So they went out and got into the boat, but that night they caught nothing. When it was already dawn, Jesus was standing on the shore; but the disciples did not realize that it was Jesus. Jesus said to them, 'Children, have you caught anything to eat?' They answered him, 'No.' So he said to them, 'Cast the net over the right side of the boat and you will find something.' So they cast it, and were not able to pull it in because of the number of fish. So the disciple whom Jesus loved said to Peter, 'It is the Lord.' When Simon Peter heard that it was the Lord, he tucked in his garment, for he was lightly clad, and jumped into the sea. "The other disciples came in the boat, for they were not far from shore, only about a hundred yards, dragging the net with the fish. When they climbed out on shore, they saw a charcoal fire with fish on it and bread. Jesus said to them, 'Bring some of the fish you just caught.' So Simon Peter went over and dragged the net ashore full of one hundred fifty-three large fish. Even though there were so many, the net was not torn. Jesus said to them, 'Come, have breakfast.' And none of the disciples dared to ask him, 'Who are you?' because they realized it was the Lord. Jesus came over and took the bread and gave it to them, and in like manner the fish. This was now the third time Jesus was revealed to his disciples after being raised from the dead. "When they had finished breakfast, Jesus said to Simon Peter, 'Simon, son of John, do you love me more than these?' Simon Peter answered him, 'Yes, Lord, you know that I love you.' Jesus said to him, 'Feed my lambs.' He then said to Simon Peter a second time, 'Simon, son of John, do you love me?' Simon Peter answered him, 'Yes, Lord, you know that I love you.' Jesus said to him, 'Tend my sheep.' Jesus said to him the third time, 'Simon, son of John, do you love me?' Peter was distressed that Jesus had said to him a third time, 'Do you love me?' and he said to him, 'Lord, you know everything; you know that I love you.' Jesus said to him, 'Feed my sheep.'" In our first reading (Acts 5:27-32, 40-41), we see the zeal and courage with which the apostles preached the risen Jesus, even rejoicing at their suffering and persecution. "When the captain and the court officers had brought the apostles in and made them stand before the Sanhedrin, the high priest questioned them, 'We gave you strict orders, did we not, to stop teaching in that name? Yet you have filled Jerusalem with your teaching and want to bring this man's blood upon us.' But Peter and the apostles said in reply, 'We must obey God rather than men. The God of our ancestors raised Jesus, though you had him killed by hanging him on a tree. God exalted him at his right hand as leader and savior to grant Israel repentance and forgiveness of sins. We are witnesses of these things, as is the Holy Spirit whom God has given to those who obey him.' The Sanhedrin ordered the apostles to stop speaking in the name of Jesus, and dismissed them. So they left the presence of the Sanhedrin, rejoicing that they had been found worthy to suffer dishonor for the sake of the name." In our second reading (Revelation 5:11-14), John continues the telling of his apocalyptic vision as heaven and earth sing praises to the "Lamb that was slain". "I, John, looked and heard the voices of many angels who surrounded the throne and the living creatures and the elders. They were countless in number, and they cried out in a loud voice: 'Worthy is the Lamb that was slain to receive power and riches, wisdom and strength, honor and glory and blessing.' Then I heard every creature in heaven and on earth and under the earth and in the sea, everything in the universe, cry out: 'To the one who sits on the throne and to the Lamb be blessing and honor, glory and might, forever and ever.'" May we have the zeal and the courage to fearlessly proclaim the risen Jesus to the world and to rejoice in our suffering because of it; and may we know that no matter how much we fail the Lord, he will simply and softly ask, "do you love me". And we are renewed in his love.